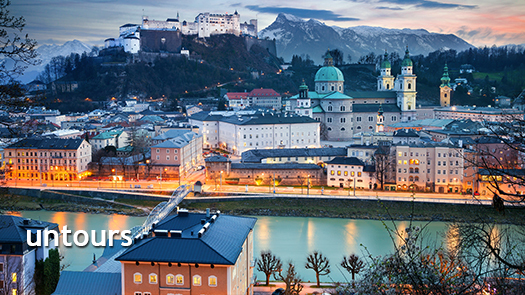 As one of the most enchanting cities in Europe, Salzburg exudes a lively air of spontaneity—this despite its rich history as the seat of the sometimes dour, always pompous prince-archbishops. Our Austria Untour places you on the outskirts of this beautiful burg. Here are nine sights you shouldn’t miss! This baroque church was constructed by the ambitious archbishop Wolf Dietrich in 1614 after the previous cathedral burned down under suspicious circumstances. It was the first known early baroque building to be built north of the Alps. Bombed inadvertently during World War II by American pilots trying to destroy SS headquarters at the base of the nearby mountain, it has now been completely restored to its former condition. On the nearby Residenzplatz, horse-drawn carriages are available for rides throughout the old city. Music lovers should not miss this fascinating house in which the Wunderkind was born. He dwelled here for the first 17 years of his life (1756-1773). His violins and piano, in addition to musical scores, letters, and portraits, are all on display in this little museum. Not as interesting as his birthplace, this museum does contain some interesting memorabilia, including letters and documents. Several old musical instruments are also on display. Directly below Hohensalzburg, this cemetery will remind you of the long centuries of history behind this ancient city. Look at the chapels behind the beautifully wrought iron grilles. Generations of Salzburg’s patrician families rest here in peace. One of the more interesting graves is that of General Harry Collins, an American general who received one of the city’s highest honors by being proclaimed an honorary citizen and buried in this prestigious cemetery. Also in the cemetery is the entrance to the Catacombs used by persecuted Roman Christians as early as the 4th century. Since 1595 this palace housed the sovereign rulers of Salzburg city and province. The audio tour of the state rooms on the 2nd floor is offered in English and takes about 45 minutes. A combination ticket entitles the holder also to admission to the Residenz Gallery on the 3rd floor. The archbishops were devoted patrons of the arts. Over the years, they assembled an impressive collection of 16th to 19th-century paintings which can now be viewed by us non-clerics as well. Built in the early 1600’s by Archbishop Wolf-Dietrich for his controversial wife (yes, wife), Salome, the palace was destroyed by fire during the 19th century. Little is left of the original building except the angel staircase. Visit this building on a Saturday morning when couples in full wedding regalia are married in a Baroque hall by the justice of the peace. The gardens provide a lovely setting for wedding pictures. These old streets are worth some time just for strolling along and window shopping. The little wrought iron guild signs and the height of the buildings on both sides of the narrow street give a real sense of what Salzburg was like back in the 18th century. This is a good area to try Salzburg’s snack specialty, Bosna, which is a pair of spicy sausages with some mustard on a roll. Enjoy all of these sites and more from your comfy apartment home base on the Austrian Untour.